Recently, there had been a lot of talk about Girl Scout cookies, and those sweet, little girls standing at tables with stacks of cookie boxes are pretty hard to turn down. Everyone has a favorite Girl Scout cookie. I’ve always liked the Do-Si-Dos and Samoas, but the hands-down most popular has to be the Thin Mint. I had heard so much exicitement about them lately, I thought it would be fun to make them from scratch. I looked through a few books and found some reasonable facsimiles, but the one that seemed closest to the original in appearance and texture was the thin mint cookies from Super Natural Cooking . The chocolate wafers are made with whole wheat pastry flour and powdered sugar, and they’re dipped into mint-flavored melted chocolate. The cookie dough was mixed and then wrapped in plastic and left to chill in the freezer for 20 minutes to make it easier to handle. Still, it was a sticky dough, and in the book, Heidi suggests rolling it out between layers of plastic wrap. I could tell that rolling it on a floured surface would have caused a lot of extra flour to be incorporated, but with big sheets of plastic, rolling the dough was a breeze. It was rolled to a thickness somewhere between one quarter inch and an eighth inch. Too thin and the cookies would have been brittle; too thick and they wouldn’t have had a nice crunchiness. The cut cookies were baked and allowed to cool. Then, semi-sweet chocolate was melted and flavored with mint extract. A tip to keep in mind is to add a little extract at a time and taste as you go. I added the extract in one half teaspoon increments and ended up adding a total of two teaspoons. But, each brand is different so, unfortunately, tasting is a task you just have to do. With a face full of chocolate, I set about dipping the cookies and then letting them dry on parchment paper. 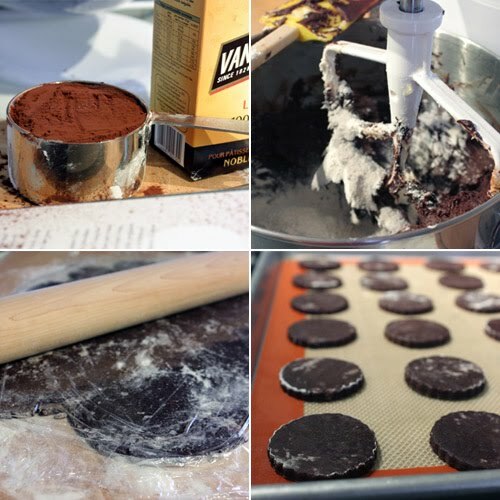 The good news about making your own thin mints is that you can choose the ingredients that go into them. In the cookies, I used Van Houten cocoa powder from France (a lovely gift that I continue to enjoy). And, for the chocolate coating, I used 58 percent cacao El Rey feves. You can also decide how minty you want them to be. It’s hard to say no to those little girl scouts selling their cookies, but the homemade version is pretty irresistible too. These are my husband's absolute favorite GS cookies (mine, too, after I developed PB probs, precluding consumption of my previous faves, Tagalongs). Your version looks, and undoubtedly tastes, even better than the originals! I need to get my greedy hands on this book and recipe immediately. Those look great. I love Super Natural Cooking too, it's a great book. I'l have to try these myself. Since I was a little girl, Thin Mints have been my absolute favorite cookie. Like the swallows returning to Capistrano, seeing green clad Girl Scouts (looking quite minty, I might add) coming to the door always filed my siblings and me with utter delight. Over the many years I have purchased and eaten Thin Mints as an adult (you can't eat just one), I have discovered--as most fans of the crisp, minty confection can attest--the cookies have shrunk in size. Wow, that thin mints look really awesome Lisa. Very neat and pretty. I love it! So cute! They look perfect! I love the idea of Girl Scout cookies but have never found them very tasty. I buy them and then let the boys eat them. I'm sure these cookies are what I really want to taste in a thin mint! I'm impressed! I have often thought of trying to figure out a recipe for these. You just saved me all kinds of work digging around for ideas - these look great! My favorite cookies! Yours look absolutely perfect. 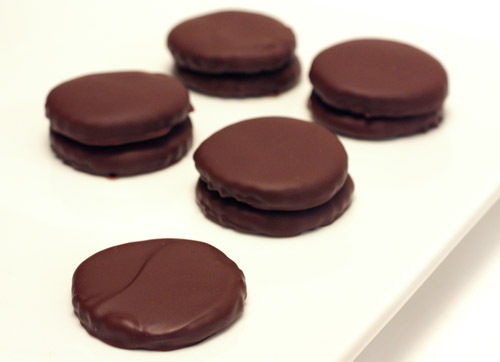 These are the most perfect home made thin mints I've seen so far! that top photo is just stunning...so simple but delectable these cookies! chocolate and mint..of my favorite combinations asnd I agree...Van Houten cocoa powder is beautiful! wonderful "scout cookies"! Wow, who needs girl scouts? Now I can have my favorite cookie all year long, yay! These are quite nice, really! You made them perfectly. Impressive! Although, my fav was always the samoas, I usually like to take a gander at the other selections. Yum!! Nicely done. If you hadn't mentioned it I would have thought you had bought them. this look great never saw the wafer style before...very nicely done~ they are totally different than the one's I make I love the chocolate ! These mint cookies are looking so lovely! Looks stunning. I wonder how you get your chocolate to look so smooth and shiny. That doesn't seem to work for me. HH: To get the chocolate shiny, I cross my fingers as it melts. ;) But really-- I'm not exactly sure, but I believe it helps to not melt the chocolate all the way over the heat of a double boiler. Remove it just before it's all melted and stir, stir, stir until it's smooth. These are beautiful mints. I love the dark innards. I'd go for these any day over a GS cookie! These look divine! This is fabulous! I would have never thought of making my own thin mints! Thin Mints are my favorite hands down, and I am afraid to confess, I could easily consume a single box in a sitting if I was not careful - I cannot just stop at one. Thankfully most cookies don't have that effect on me. Super Natural Cooking is a great book, and I love the idea you can make your own - I've tried to avoid that for the reason stated above, but maybe I can be brave and exhibit some self control! Wow...looks very delicious. I wish I can have some! These look great - being English I've never had the Girl Scout version, but they look very tempting! I love mint and chocolate together. I always loved girl scout cookies...haven't had them in a while but samoas were a definite favorite. Thin mints are perfect for when that mint chocolate chip craving hits (which it does...about once a week). These definitely look better than the "real thing". The blog Baking Bites has created copycat recipes for quite a few girl scout cookies. You might want to check out that site! Oh wow these look perfect! My whole family loves thin mint cookies! Oh they look so beautiful! get out of town! these look amazing! These are pretty and very special looking cookies. Love them! I am torn between loving you for handing me this recipe on a platter, and hating you for handing me this recipe on a platter. Love wins. Thin mints year-round - YEAH! These look wonderful. The boy loves all things choc-mint. I once tried choc-mint brownies but they were a disaster. These look perfect. I think I might try it and surprise him. Thin mints are my fave after dinner "dessert" --light and refreshing. They are specially good after a roasted lamb dinner like the one I made last week. I'm doing a blog giveaway too if anyone of your readers is interested. 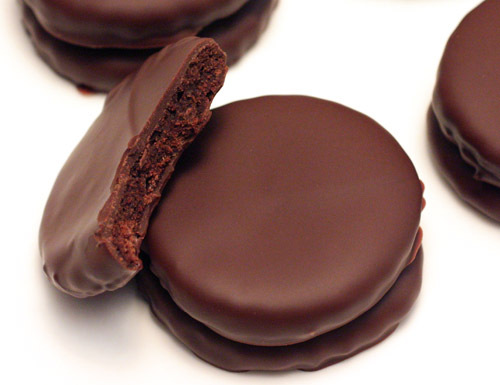 Homemade thin mints sounds wonderful and I love the pictures! The combination of mint and chocolate sounds very interesting. The cookies look beautiful. I love cookies like these! you made them so perfectly. love combi of choc and mint! WHAT!?!?! Those look even better than the Girl Scout Cookies! This is ingenious! Nice one, Lisa! who needs over-priced thin mints from girl scouts when you can make it yourself at home? oh my, you did a fantastic job of making these cookies! bravo! Oh wow, look at how perfect they are! These are great! Is it possible to get the recipe without buying a book? Anonymous: You may check with Heidi at 101cookbooks.com. I don't re-print copyrighted recipes from books. I do give recipes when they are my own or when the source is no longer available. You might not be checking this anymore give that the post is a few months old, but how do you coat them in chocolate and then pull them out without leaving fingerprints!? Anonymous: I drop each cookie into the chocolate and then use a fork to lift and let excess chocolate drip back into the bowl. These look fantastic! I was just doing a quick search for Baking Powder's post on homemade Thin Mints and your post popped up! I made a batch of homemade samoas (my fav). Somehow I missed out on the whole homemade GS phenom until recently. Thank you so much for this recipe. The best and easiest one around!